Since the attack on the Westgate shopping mall in Nairobi 21st -24th of September 2013, violence has continued to ravage through Kenya. Numerous attacks have seen hundreds killed in what seems to be random killings of innocent civilians. In several of them, the Somali terrorist organization alShabaab has claimed responsibility, citing Kenya's defence forces presence in Somalia as a reason. However, Ethiopia, also with troops in Somalia to support the fragile government, has not seen any alShabaab attacks. It is not only that Ethiopia's repressive regime has a security apparatus that fully controls every single citizen, that has prevented attacks on Ethiopian soil, there are probably more sinister explanations for alShabaab's terror attacking Kenya. Kenya is still burdened with deeply running divisions among it's more than 40 tribes. As what it's politicians still are doing, a terrorist organisation, can also easily profit on the ethnic cleavages, and the deeper they become, the better. If there are different religions present, even more possibilities to create an atmosphere where fear and distrust can be exploited. People exposed to violence need someone to protect them and if injustice and impunity are mixed in, we have a dangerous situation where the civil society, innocent civilians, democracy, human rights are the loosers. 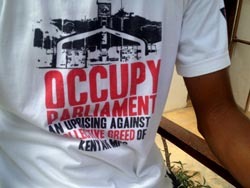 That is the situation today in Kenya. 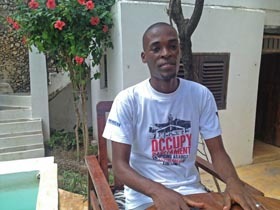 Athman Issa, activist, Muhuri. His T-shirt tells all. 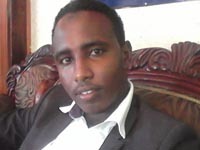 -This confrontation between the locals and the national government and the county government, it might bring about the issue of terrorism, that is alShabaab, if the gov is not going to employ new ideas and a new strategy to combat the situation. The situation om the coast is tense. 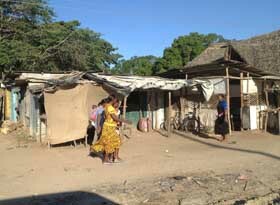 This is where the "Swahili culture" was created centuries ago. Trade with slaves from the interior, quite many of the up to 18 million slaves the Arabs captured, helped make the coast of today's Kenya and Somalia important. Later on trade eastward brought spices etc and also the Islamic religion which is dominant among the Swahilis. 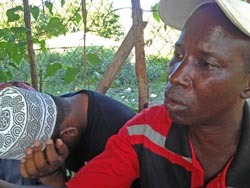 The last years alShabaab has increased it's activities along the coast, using mosques and some imams to seduce youths with messages of hatred. In turn the police forces have, according to human rights organisations, terrorised the population, raided mosques, arrested innocent bystanders, even blank killing of some perceived to be terrorists by the infamous "ATPU", Kenyan Anti-Terror Police Unit. See reports from ICG, International Crisis Group, among others. 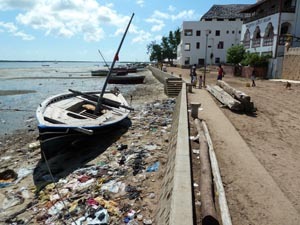 Land grabbing done by Kenya's wealthy political business elite is no exemption on the coast. Especially close to the LAPSSET project close to the border of Somalia where a new port is beeing built. Property prices have risen ten-fold and the indigenous people who have lived for centuries, has seen it's land illegaly taken over. While the land was inherited since generations, no papers exist that can function as proof of ownership and mighty people can easily bribe courts to issue the right papers. Poor farmers can not afford a juridical process, especially hard to follow when many are illiterate. Maulidi Khalif, Mokowe, got plenty of acres stolen. -There are bosses here who have got money, they are billioneres. 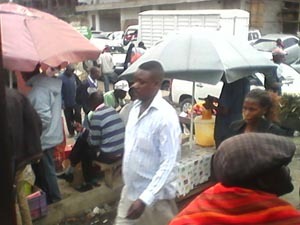 They just come, cooperate with the county government, even the security department now. We are now wanted with them because when we try to make demonstrations fighting for our land, we are just beeing arrested and warned. So we don't know where we can go to claim for our rights. All this has lead to a huge distrust of Kenyan authorities and the juridical system, making it easier for alShabaab to recruit. Attacks on police stations are common, like the police's answer: more arbitrarily arrests, harassment and killings. Tourism is of course affected, mostly on the coast. 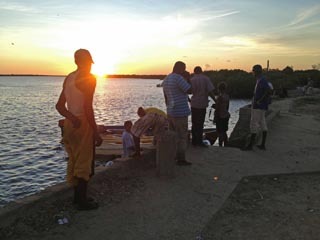 The beautiful, friendly island of Lamu is empty, plagued by a dusk-to-dawn curfew since this summer, extending all over the northern part of the coast. That has ment several tens of thousands beeing laid off, without income and an even more desperate situation. Several hotels and tourist businesses have been forced to close, and for those with big money, now a good opportunity exist for takeover. Many along the coast see this as the prime reason to keep the curfew in place, especially on Lamu where no attacks have taken place lately. 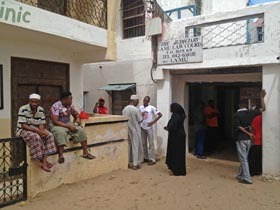 Lamu Court, protesters against the curfew end up here. 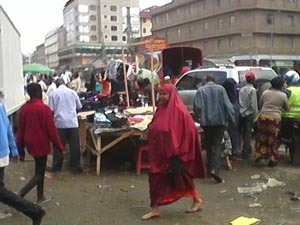 Eastleigh, home to some of Kenya's 2,4 million etnic Somalis. In this atmosphere, only terrorism will grow. The population has lost all trust in the police and the police has lost it's main weapon in fighting terrorism: intelligence, which is deeply dependant on people's readiness to share information to the security agencies. -Actually, the police are the one radicalizing the youth, because, if you maybe try to target a certain community regardless of looking for the criminals, a blanket condemnation of the whole community. That will lead to radicalization because if my brother was attacked by the police tomorrow, I feel the next person they are going to attack is me. So you feel that you are radicalized. Generally the police is an enemy, that is the position of the people. But what is worst is the total lack of strategy from the government. Today, according to well-informed sources within the security organisation, terrorists can bribe their way through police checkpoints from the Somali border all the way to Nairobi. What is needed is a total reform and reorganisation of the police, better wages and an independent police audit system, directly under the government which will then carry full responsibility if the security forces lack in efficiency. The new constitution gives the tools for such an implementation, what is lacking is just the will among top politicians.